Grants and awards have evolved over the life of the chapter. The first award was for volunteering, presented as the Charlotte Award to Anne Lintell in 1999. As the chapter has grown and leadership has changed, other awards have been introduced, gone dormant, been revived or revised. You’ll find them all listed here in the . . . 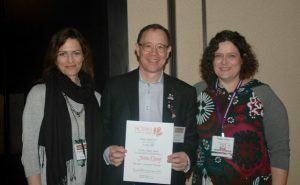 The award can be granted to writers, illustrators, educators, editors, publishers, or organizations. 2018 Anne Shirley Award, Julie Prescesky. Left to right: Peggy Collins (IC), Julie Presscesky, Alma Fullerton (RA), Michelle Jodoin (ARA). 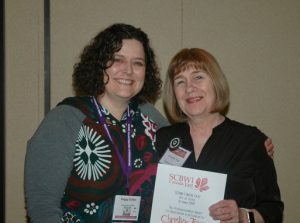 This award, given at conferences featuring an illustrators’ gallery, recognizes creativity, talent, professionalism, and the suitability of the displayed works for children’s publishing. 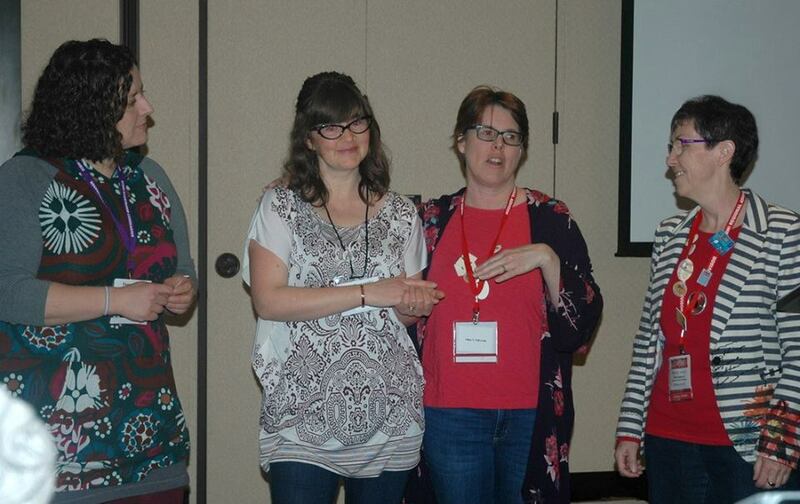 The prize is awarded by the conference speakers to the illustrator they would track down glass-slipper style. 2018 Glass Slipper Award Winner, Julien Chung. 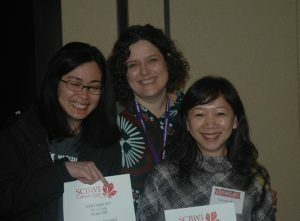 Left to right: Elizabeth Parisi, Julien Chung, Peggy Collins (IC). This award, given at conferences featuring an illustrators’ gallery, is awarded based on the votes collected from conference attendees (including speakers). 2018 People’s Choice Award Winners, Charlene Chua and Carmen Mok. Left to right: Charlene Chua, Peggy Collins (IC), and Carmen Mok. Conference speakers award this prize to the illustrator whose portfolio demonstrates the most effective and consistent storytelling. 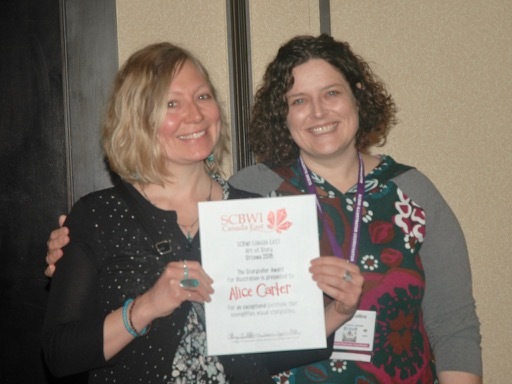 2018 Storyteller Award winner, Alice Carter (missing from photo Carmen Mok). Left to right: Alice Carter and Peggy Collins (IC). 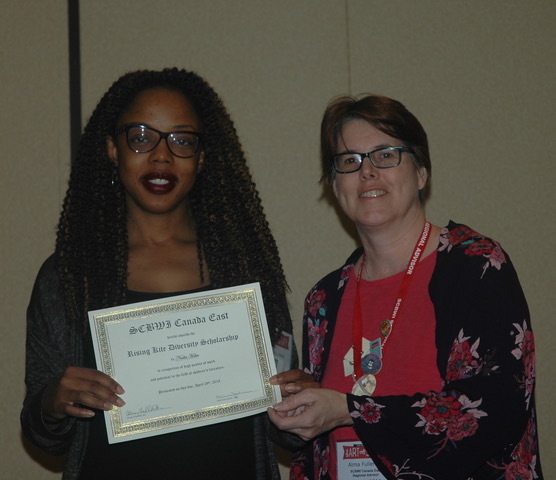 2018 Rising Kite Diversity Scholarship Award – Nadia Hohn. Left to right: Nadia Hohn and Alma Fullerton (RA). Conference speakers award this prize to the illustrator whose portfolio exemplifies professional presentation and content. 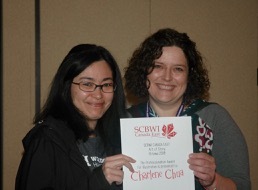 2018 Professionalism Award winner, Charlene Chua. Left to right: Charlene Chua and Peggy Collins (IC). 2018 Professionalism Award winner, Christine Tripp. Left to right: Peggy Collins (IC) and Christine Tripp. The SCBWI Canada East Children’s Book Week Grant provides funds to allow an author or illustrator to give a school presentation during Children’s Book Week. Beginning in 2019, the Northern Lights Award will be awarded once again for the best manuscript submitted for critique at the Art of Story conference. 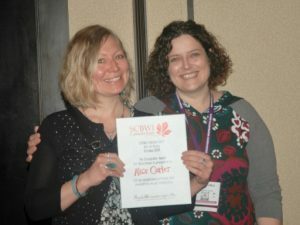 This time, however, two awards will be presented for the winning submissions — one for picture books and one for novels. The Gift of Creativity is a bursary that is offered every year to an attendee of the Art of Story conference. Thanks to the generosity of participants at previous SCBWI Canada East events, we’re pleased to offer financial assistance to one member to help defray the cost of attending the conference. To apply for the bursary, please submit a letter outlining what you hope to gain from this event. Please include a brief mention of why you need financial assistance. Although the bursary will not cover the entire cost of the conference, we hope that it will provide that extra boost to get you on your way. Recipients are notified privately and are only announced publicly if that is their wish.